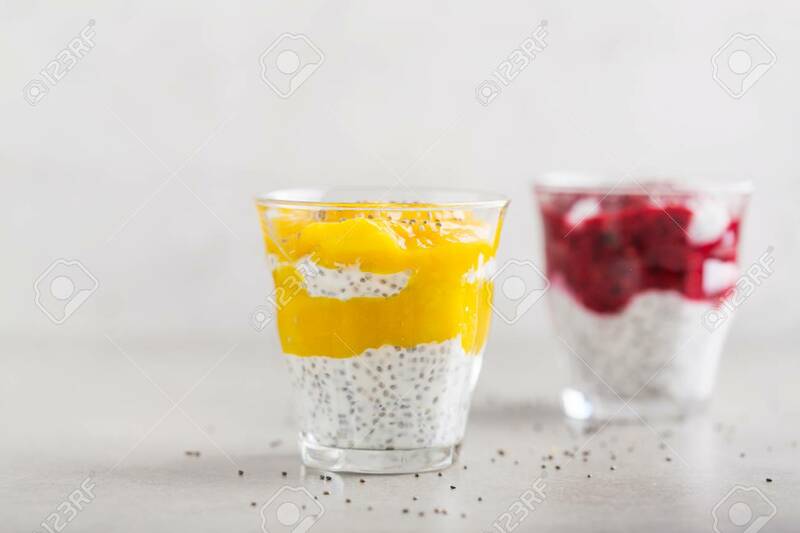 Tasty Healthy Appetizing Yogurt Desserts With Chia Seeds, Mango And Berry Puree In Glasses. Closeup With Copy Space. Grey Background. Lizenzfreie Fotos, Bilder Und Stock Fotografie. Image 114631584. Standard-Bild - Tasty healthy appetizing yogurt desserts with chia seeds, mango and berry puree in glasses. Closeup with copy space. Grey Background. Tasty healthy appetizing yogurt desserts with chia seeds, mango and berry puree in glasses. Closeup with copy space. Grey Background.